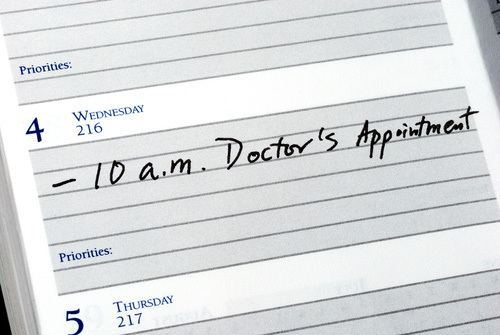 We operate on an appointment system. We have introduced a telephone triage system which means you may be offered a telephone consultation with one of our GPs in the first instance, who will be able to assess how best to deal with your problem. A standard face to face appointment is 10 minutes, with longer appointments available on request (i.e. double or triple appointments). If you require a full medical examination, have complex health problems or would like a counselling session, you will need a longer appointment. Please advise the reception staff when making an appointment. Patients are encouraged to request their preferred GP when making an appointment. When attending the practice for the first time, please allow 15 minutes before the appointment to complete a Patient Information Form. In the interests of providing improved services to our patients we have evening surgeries available on Thursdays until 19.15. In cases where a patient has difficulty understanding or speaking English, the patient may wish to have a relative/friend who is able to assist, sit in during the consultation. This is your decision and our doctors are happy for this to happen. Otherwise, we can offer the services of an interpreter. Please advise the staff so we can arrange this for you before your appointment time. All our doctors are available to our patients by telephone. If you wish to speak to a doctor on the telephone and the doctor is consulting or otherwise engaged, a message will be taken and the doctor will be notified by the practice staff. The doctor will return your call as soon as possible. In an emergency situation, your call will be put through to the doctor/nurse immediately.